Brandon was hired by Mohawk Ambulance Service in 2011 as an EMT. In just a few months’ time, Brandon’s excellent leadership skills became apparent, and in 2012 he was promoted to supervisor. In 2014, he became a Paramedic, then rose to Station Leader. Because of Brandon’s dedication and expertise, he was able to seamlessly step in for six months to cover for a Regional Manager. Brandon was born and raised in Gloversville, New York. After an active duty tour in the military, he returned to Gloversville, which he still calls home. 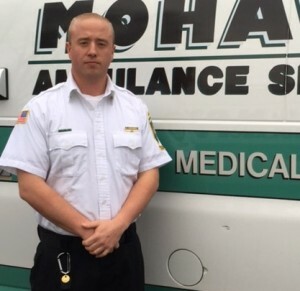 He received his Certificate in Paramedicine from SUNY Cobleskill, and has earned two Distinguished Service awards during his tenure at Mohawk. He likes working with others and helping people in a fast-paced, high-stress job. In Brandon’s spare time he is a volunteer firefighter. He also enjoys spending time in the outdoors hiking, hunting, and fishing. Mohawk Ambulance Service is proud to honor Brandon as an American Ambulance Association 2016 Star of Life.